After enjoying membership with Fine Art America for about three years, this amazing artist-driven firm has come up with yet another valuable contribution to my marketing tool chest. Now, for the first time ever, FAA has created the opportunity for you to purchase Museum-Quality (acid-free inks and paper for extreme fidelity and longevity) Prints directly from the artist's website and blog! How cool is that? When you click on any of the images below, a complete array of options will pop up with your shopping cart. Easy, fun and affordable. I started writing my "memoir" almost 20 years ago. I had some time to myself and a nice thick sheaf of foolscap. There was a pen nearby. Some sixty or more hand-written pages later, I'd laid down the foundation for what would eventually become a full-blown trilogy called "Dancing with Rejection: A Beginner's Guide to Immortality"
The premise of the book is...EVERYBODY has a story, but it needs to be written down. Otherwise, it will be simply lost to the passage of time. Predicated by the fact that my father died at the tender age of 31, on November 22, 1963, I realized with a jolt that life on this planet is a temporal thing that we ought not to take for granted. As a life-long artist who has dealt head-on with the ravages of kidney failure...that damn near wiped me off the face of the Earth at age 19 in 1979, I started to think early on about the prospect of simply dying an ignoble, anonymous death. This gloomy scenario was met with fierce resistance by my young, vibrant spirit. It would not do! After I was diagnosed with End-Stage Renal Failure at Sunnybrooke Hospital in Toronto, the doctors there initiated emergency dialysis therapy to save my life. Only 15 years prior to this, my Dad wasn't so lucky. 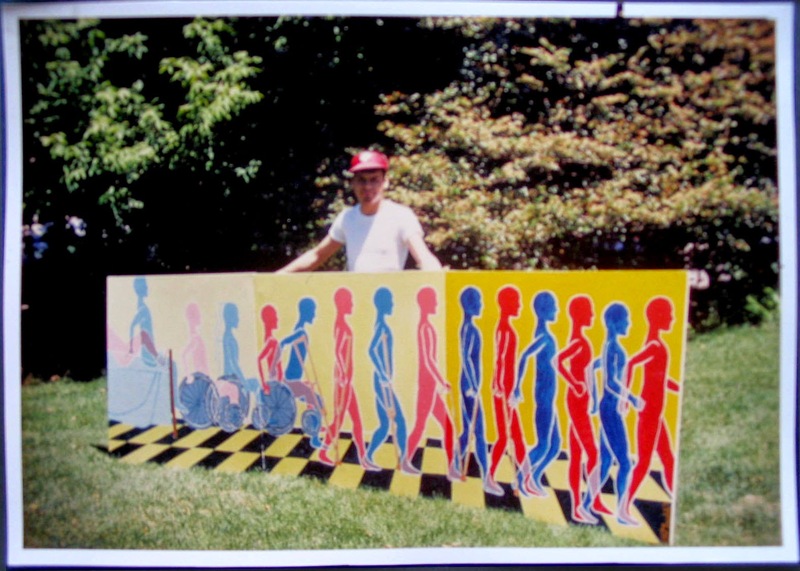 Once I felt a little more human...as in, less like a walking toxic waste dump...I designed and painted my first "monumental mural" and donated it to the hospital that saved my life. "Recovery 1" was designed and painted at age 19 and donated to the hospital that saved my life. I went on to receive the "Gift of Life" aka a kidney transplant from my brother Steve on October 17th, 1979. This allowed me to thrive and prosper for almost 35 years, during which time I carved out a career as muralist, painter and gallery owner/operator. 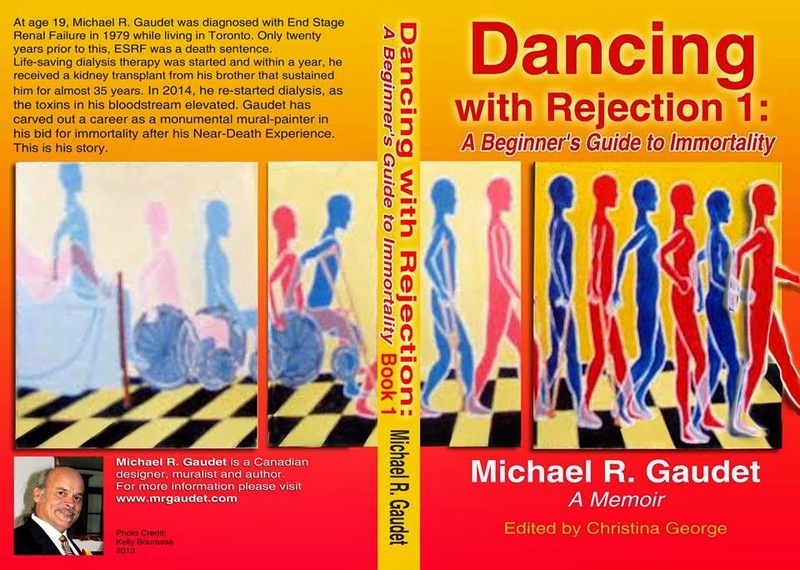 In May of 2014, my doctor told me that I must return to dialysis therapy, as my graft was failing. The toxins were accumulating once again to potentially lethal levels. This news injected an increased urgency for me to to juggle all of the moving parts required to finish writing my memoir, and to get it published. It is only by the grace of God and all of my personal angels, along with "a little help from my friends" that this dream is achievable. 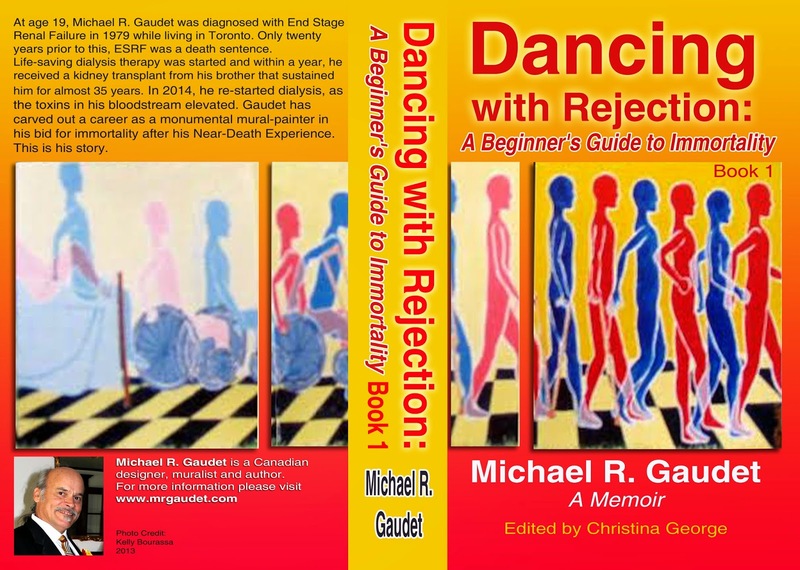 By the look of things, the first two installments of the trilogy "Dancing with Rejection" will be published in the 2015 calender year. The time I've spent (4 hours, 3x a week) on dialysis has been fruitful. Blood cleaning to keep me alive, and pecking away on finishing my manuscript! Ordinarily, I would have simply paid for the initial cost of production, publishing and marketing of my book(s) myself. My career as a professional mural-painter and gallery owner has been very good to me over the years. But, these are not "ordinary" times. Three days a week dependent on dialysis has impacted my earning power, to say the least. With this in mind, I have reached out to my family and friends for help with a GoFundMe campaign. This was initiated only about two weeks ago, and has been incredibly successful, generating almost 30% of my target and over 100 "shares" in this short time! Please click through this link to read more, and to share the story if the spirit moves you. Thank you in advance for your generosity of spirit. Zoning in on the Dreaded "Formatting" of Upcoming Memoir! If you thought "formatting" was easy, then think again. I am discovering...the deeper I drill into this...that it is a nasty, unforgiving business. Everything you do affects the remainder of the manuscript. "Book 1" and "Book 2" as two separate entities. The more I thought about it, the more sense it made. Now, instead of having a big honkin' BRICK of a book...at almost 1000 pages...I will have two more manageable volumes. After all, as my friend Sarah so succinctly pointed out, a book must be "ergonomic" at the very least. That is to say, not too bloody heavy. It's not supposed to be an exercise regime! Now, just to keep up the tradition in this space of being "very image-rich", I am posting the latest version of the cover! While I realize that this version is not drastically different from the previous, there ARE some changes. 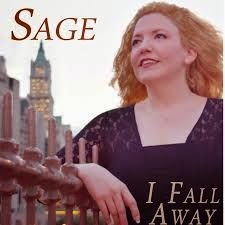 Please note that this cover art now signals this is "Book 1". See? I told you I was on a steep learning curve.